One of Oregon’s most beautiful alpine lakes is Diamond Lake, located just north of Crater Lake about 95 miles southwest of Bend. A pristine alpine lake with a surface elevation just under one mile. Spectacular views of nearby Mt. Thielsen’s distinctive 9,182 foot peak. A popular winter recreation area for snowmobiling, cat skiing, and cross country skiing. About 95 miles southwest of Bend and about 12 miles north of Crater Lake. Tucked deep in the heart of the Umpqua National Forest about 10 miles from Crater Lake is a pristine alpine lake known as Diamond Lake. It offers spectacular views of Mt. Thielsen - one of Oregon’s most distinctive and picturesque peaks known for its jagged, pointed peak. Diamond Lake, Oregon was named after a settler, John Diamond, who discovered it in 1852 while he was summiting nearby Diamond Peak. The Diamond Lake area is popular for a variety of activities including camping, fishing, hiking, cat skiing, snowmobiling, and cross-country skiing. Diamond Lake, OR is located about 95 miles from Bend. To get there take Hwy 97 south for 76 miles. Turn right on Oregon Route 138 – the lake is about 19 miles ahead. The lake is usually closed to fishing from the beginning of November to some time in April. Fishing – Avid anglers will appreciate the lake’s abundant rainbow trout, which are usually more readily caught from a boat than from the shore. Camping – There are three campgrounds near the lake that provide more than 400 camp sites surrounded by beautiful forest. Cross Country Skiing – The area around Diamond Lake offers more than 50 miles of marked back country trails for skiers, as well as 8 miles of groomed trails. Snowmobiling – A very popular winter activity, snowmobilers can access over 300 miles of scenic groomed trails - courtesy of the Oregon State Snowmobiling Association and Diamond Lake Resort Oregon. Cat Skiing – Diamond Lake Resort offers exciting snow cat skiing on nearby Mt. Bailey during the winter. This provides avid skiers with access to pristine fresh powder in one of the most beautiful places in Oregon. This alpine lake has a surface elevation of just under a mile, at 5, 183 feet. The lake’s maximum depth is 52.5 feet, and it covers 2, 824 acres. Nearby Mt. Thielsen is 9,182 feet – a shield volcano that is considered extinct. 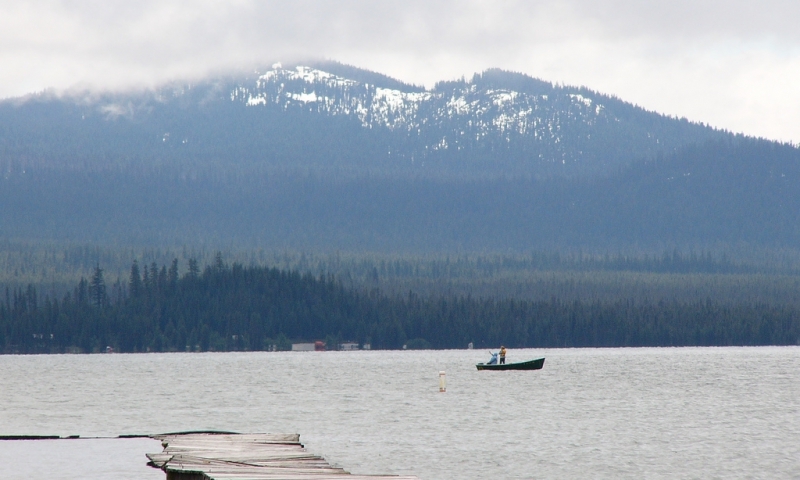 There were no fish in Diamond Lake before the ODFW started stocking it back in 1910. Great small town on a gorgeous lake in the Eastern Sierras.